When we brought him home, his eyes were robin’s-egg blue. Now they’re a beautiful amber, usually wide open with curiosity. On his first day of school, I proudly watched as he overcame his fear of his classmates and started making friends. When he needed stitches, I carried him into the doctor’s office. I was distraught, but he bravely endured the needle. Eventually we settled on getting a weimaraner. One weekend, on a whim, I opened the Sunday newspaper to the classified ads for pets--and saw a listing for a 10-week-old weimaraner puppy. Needless to say, I fell in love with the little blue-grey pup on first sight. 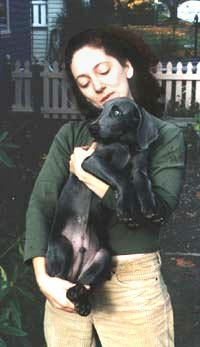 Sisko as a wee pup, after an unauthorized foray into the vegetable garden. When I brought home the newly christened Sisko, our real learning process began. No matter how much I’d thought I was doing as kid to help care for our family dogs, I now know how much of the work my parents were handling. Not to mention how much money they must’ve been spending! Right off the bat, I shelled out for food and water dishes, leash and collar, bed, brush, food, odor-neutralizing spray (essential during housebreaking! ), and chew toys. And that was before a single vet visit, obedience class, or overnight trip. My family had dogs when I was young--mostly strays--so I thought I knew what I was in for. Sisko, however, is the first dog in my so-called adult life, as well as the only one I’ve raised from puppyhood. I quickly learned that there’s much more to rearing a dog than fetch, walkies, and inventing new ways of sneaking medicine into his food. First off, there’s the question of what kind of dog you want. A lapdog? Guard dog? Playmate for your kids? Camping buddy? Specific breed, or Heinz 57 mix (as my dad used to fondly call our mutts)? Puppy, or full-grown? In addition to size and temperament, consider each breed’s original purpose. Tracking/hunting dogs like Sisko love to sniff trails and are prone to bolting after small animals. Our neighbor’s dogs, Yogi and Roux, are both herding dogs who love to run and chase--especially skateboarders, bicyclists, and rollerbladers. We keep a close eye on them in parks. Now Sisko's almost as tall as Anina! My dog-loving friend Marilee gave me a wonderful book called The Art of Raising a Puppy by the monks of New Skete, who raise and train German shepherds. She also sagely advised me to get young Sisko into an obedience class. Most such classes accept pups at a minimum age of 3 months, after they’ve been vaccinated. In the meantime, I checked brochures and bulletin boards at my neighborhood pet shops (great info sources! ), made phone calls, and selected Valley View Canine (503-257-6094), owned and operated by Lynette Alfano. Before classes started, I worked with Sisko, teaching him simple commands like sit and stay. We also established boundaries early on: he slept on his bed at night, not ours; he got no scraps of our food during our meals; and we used play, rather than treats, as a reward for obedience. Valley View’s Puppy Preschool and Obedience I classes open with an informational/Q&A period, covering topics from grooming to behavior to emergency first aid. The main part of each class is a well-structured training session, followed by a brief playtime. Sisko has advanced to off-leash training, but his favorite class by far was Canine Fun & Agility, an obstacle-course run designed to build confidence and coordination. Training involves as much education for owners as for their dogs. Sure, there are standard techniques--deep voice for corrections, hand signals, etc.--but you must tailor your approach to your dog’s personality. 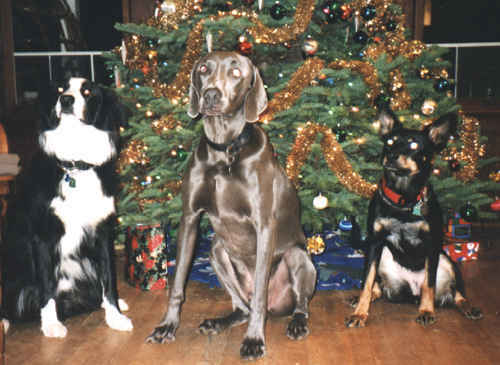 Timid dogs, for example, can be frightened by firm commands, whereas stubborn dogs (like Sisko) need frequent, consistent corrections and a strong command voice. 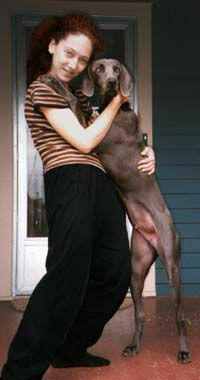 A good trainer will help you understand your dog’s behavior and how best to interact with him. Like kids, puppies need plenty of exercise to work off their boundless energy--especially working breeds such as herders or hunters. They also choose their own friends (pack members, in canine lingo) and may rebuff your efforts to entice them into romping with likely-looking playmates. When Sisko was about 4 months old, I started walking him to the off-leash area on Mount Tabor, down the street from our house. (The dog area later became a subject of civic controversy, but that’s another story. For more info on off-leash areas, call your local parks department.) There, dogs cavort freely while their owners compare notes on doctors, schools, behavioral stages, vocabularies, and of course, poop. After a few weeks, I knew the names of most of the dogs we saw regularly, but I knew their owners only as Boo-Boo’s dad or Jake’s mom. Once our pups had played together for another month or two, we introduced ourselves and struggled to remember each other’s names. And now I have dog buddies like Marc (Boo-Boo’s dad), as well as near-daily play dates to run our pooches. Puppy friendships can be as volatile and transitory as those of young children. A happy tussle can abruptly morph into a serious fight, or dogs who start out as friends may later act aloof with one another. On the other hand, once an adult dog accepts another dog or human as part of its pack, those family ties can last a lifetime. I’m dreading the day when Boo-Boo moves out of town this fall. I know Sisko will pine for her, and it’ll take him a long time to find a new best friend. Worse yet--and here’s where his being a dog is a major drawback--there’s no way I can explain things to him. From his perspective, Boo will simply vanish from his life when she leaves. Yogi, Sisko, and Roux in a rare moment of stillness. "Siiiiilent night..."
The first time Sisko was away from us overnight, I was more upset than he was. I’d dropped him off at the vet’s office, limpid puppy-eyes and all, to be picked up the next day. I kept worrying about how his furry little mind would interpret this abandonment. Thankfully, when I collected him, he was overjoyed to see me and eager to go home. The first time we went out of town, I was at a loss. Marilee, bless her heart, agreed to keep Sisko at her house. We later found a woman who boarded dogs in her Portland house and made sure they get exercise every day--a homey alternative to kennels. Alas, she's since quit the dog-sitting biz, so now we rely on trading off with our dog-owning friends when we travel. If your dog can stay in your house alone, another option is to have a dog-sitter stop in to feed, water, and walk him. Occasionally we’ll take Sisko along on an overnight junket, aided by books listing dog-friendly lodgings, eateries, and parks. (The two I have are Travel With or Without Pets, M.E. Nelson, ed. ; and Doin’ the Northwest With Your Pooch by Eileen Barish.) On one such venture to Hood River, we stayed at a lovely B&B (The Beryl House, 541-386-5567) where Sisko played with local dogs, explored orchards, chased birds, and waded in the Columbia River. Of course, we had to bring along his travel dishes, food, water, and toys--accessories are everything. Sisko’s 2 1/2 now, which makes him a teenager in dog years--and it shows. He’s more protective of our yard, cockier, and sometimes he acts snotty with younger dogs. I catch myself thinking ever more parental thoughts: "It’s your own fault if you’re bored! Go play with Boo." "You don’t know how good you’ve got it, little mister." I confess I’ve slacked off on his training a bit, so he doesn’t heel very well anymore. But he still comes when I call his name (mostly) and wiggles his stubby tail with delight every time I walk in the door. And I know that in just a few years, he’ll be a mature, responsible hound.